theAd>> These are hand made. 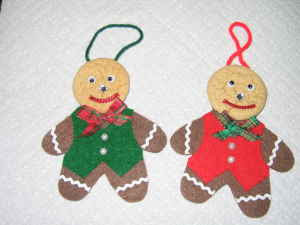 With a real ginger cookie for the head.Sold as a set of 2. I have lots of sets. Cash Only. You need to pick up. NO on Prop 8! These two deserve to be happy and have all the rights that other cookies have. They are not hurting anyone. They are certainly not tearing apart the fabric of the American Family. Sheesh.